Not all lash extensions and stylists are created equal. Properly applied and maintained lash extensions will not damage your natural lashes. Jane is a Certified Xtreme Lash® Lash Stylist. The health and safety of your eyes and lashes are forefront in her services. Each set design is tailored to appear either very natural or for the more daring, a very glamourous look! 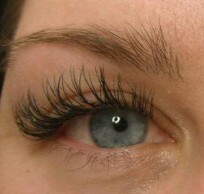 They are applied lash to lash, insuring that each lash maintains its natural placement in the lashline. Appointments for new sets may run in excess of 2 hours and are secured with a credit card. 24 hour courtesy for cancellation necessary.